Eating a nutritious breakfast each morning can help regulate your blood sugar levels and get your metabolism going after a long night's fast. Whole-grain oatmeal is a healthy choice as it's naturally low in sugar and fat and high in fiber, which fills you up and keeps you feeling full so you're less likely to reach for an unhealthy midmorning snack. To get your metabolism going but avoid taking in too many calories, stick to a standard serving size and avoid added sugar and fat. Whole-grain oatmeal has only been minimally processed and still retains all three parts of the grain: the germ, bran and endosperm. This means it retains all of the nutrients, such as B vitamins and fiber, that are stripped away when grains are refined. Whole grains are considered complex carbohydrates. These types of carbs have a more complex chemical structure and take the body longer to break down. The body also has to work harder to break down whole grains, which gives a boost to your metabolism. Choosing a breakfast with complex carbs, such as whole-grain oats, can maximize your body's ability to burn fat, says nutritionist Christina Carlyle. 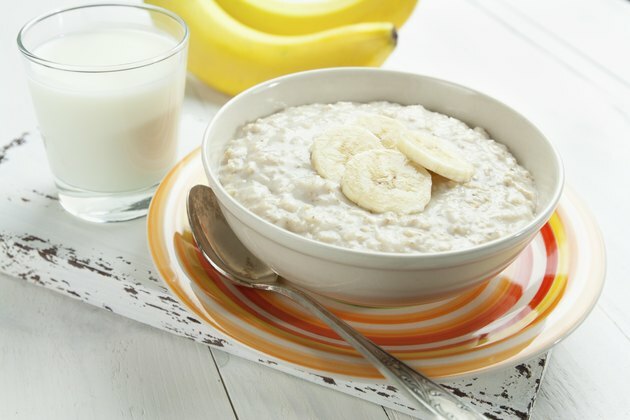 Eating oatmeal in the morning to get your metabolism going is an important part of maintaining or losing weight; however, if you eat too much oatmeal in the morning, you may end up taking in too many calories, which could lead to weight gain. A standard serving size for oatmeal is 1/2 cup of dry oats mixed with 1 cup of water or 1 cup of low-fat or skim milk. One-half cup of dry oats provides 150 calories, for a low-calorie breakfast meal. If you prepare your oatmeal with 1 cup of skim or low-fat milk, add another 83 or 102 calories, respectively. Steel-cut oats are more caloric, with 150 calories per 1/4-cup dry serving or 3/4 cup cooked. You also need to prepare it with 1 1/2 cups of liquid; if you use milk, add 126 to 153 calories. If weight loss is your goal, you'll want to be wary when choosing oatmeal in the cereal aisle. Many varieties have added sugar, which drives up the calorie content. For example, a serving of instant oats flavored with maple and brown sugar has 158 calories. Also, because instant oats are more processed so that they cook more quickly, they have less tummy-filling fiber -- a serving has 2.9 grams of fiber, compared to 4 grams per serving of steel-cut or regular oats. Cook whole oats from scratch and avoid adding butter or sugar. Instead, stir in some fresh berries, which are naturally sweet and low in calories and provide extra fiber. In addition to eating a nutritious breakfast of whole grains, there are other diet and lifestyle changes you can make to rev your metabolism. The Medical University of South Carolina suggests not skipping meals and eating every three to four hours. Make sure you are eating enough because if you consume too few calories, your metabolism could slow. Also, eat a diet rich in fresh veggies and fruits to get the nutrients necessary to support healthy metabolism, and drink lots of water. Get plenty of exercise and work more activity into your day. Get up from your desk for a quick walk every hour -- even if it's just to the bathroom. Go for a brisk walk on your lunch break, and when you hit the grocery store after work, park in a spot far from the door so you get in a little extra exercise.